Before I get started let me make a few disclaimers. (1) I have attended both an HBCU and a predominantly white institution (PWI); and (2) I’m ecstatic when anyone gets a college-level education and even more so when it is in STEM, I’m indifferent about where one chooses to attend. Last year the National Science Foundation’s National Center for Science and Engineering Statistics published a report entitled Women, Minorities, and Persons with Disabilities in Science and Engineering. This is a biennial report in which the Center systematically looks at longitudinal data on the progress of the subjects mentioned in the title of said report. If you’re wondering why they even bother, the answer is simple: money. There are several funding initiatives aimed to increase the number of under represented minorities in STEM. Often times, these are tax payer dollars, so a justification for this type of expenditure is always necessary. Consider the analysis of this data like a progress report of sorts. If you are interested, the full report and data can be found here http://www.nsf.gov/statistics/wmpd/2013/start.cfm. 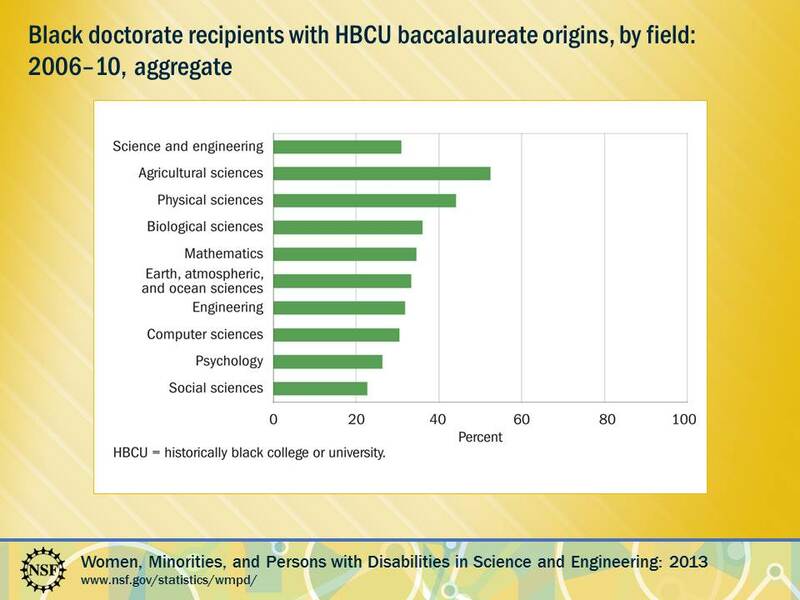 One of the most striking figures in this report shows Black doctoral recipients with HBCU baccalaureate origins, found below. I find it interesting that more than 30% of Black PhDs in science and engineering attended an HBCU for undergraduate study.This remains true despite the fact that the Black students in STEM fields at HBCUs has dropped from 26% to 19% between 2001 and 2010. Simply stated, although fewer students are in STEM at HBCUs, those students are more likely to earn a PhD in STEM. In fact, according to the National Center for Education Statistics, in 2011 only 2% of PhDs awarded in the Physical sciences (chemistry and physics) were earned by black students. Obviously there is something about the HBCU undergraduate experience that breeds success in STEM. Here are some potential reasons based on my personal experiences. 1. Smaller classes. At my HBCU, the largest science class I ever enrolled in was Honors General Chemistry and it had about 30 students in it. Compare that with the same class at my PWI alma mater which was held in one of the largest lecture halls on campus, seating 175. Large introductory STEM courses create a formidable task for both students and professors. Professors must keep the brightest student in the room engaged while hoping that students who may be struggling can keep up. In a class of 100+ that’s a pretty huge spread. It’s also more difficult for an under performing student to go unnoticed in a small class. The professor has more time to engage in substantive conversations at office hours to get students up to speed. I would argue that this type of learning experience teaches students how to better identify and strengthen their weaknesses which is absolutely necessary when faced with challenging higher level STEM courses. 2. HBCUs provide an inherent confidence boost. Nothing really compares to seeing someone who you can relate to on several levels be successful in something to which you aspire. At an HBCU, students have the rare opportunity to interface with black STEM PhDs daily. These living, breathing examples silently communicate to students at HBCUs that they too could be a university professor or a cancer researcher. Over time this builds confidence to set goals that might have seemed unrealistic on that student’s first day of college. 3. HBCUs benefit from what Prof. Melissa Harris Perry calls “fictive kinship”. In her book, Sister Citizen, she describes fictive kinship: “The term fictive kinship refers to connections between members of a group who are unrelated by blood or marriage, but who nonetheless share reciprocal social or economic relationships… This imagined community of familial ties underscores a voluntary sense of shared identity… Fictive kinship makes the accomplishments of African-Americans relevant to unrelated black individuals.” It is because of fictive kinship that already overwhelmed professors tirelessly continue to mentor their students at HBCUs, making them aware of the vast array of opportunity that is available in STEM. The fruits of these often life-long relationships include career coaching, hands-on research experience, and importantly, someone with whom to discuss the nuances of “being the only one” in professional situations after graduation. While one or more these qualities may be found on a case by case basis at PWIs, I would argue that they are ubiquitous at HBCUs. There are clear benefits to attending one of these universities if you wish to pursue STEM. HBCUs play an undeniable role in increasing the diverse pool of researchers, doctors, and engineers meaning more cures, more ideas, and more technology for the future. Isn’t that what STEM is all about in the first place? This entry was tagged Diversity, Education, HBCUs, STEM. Bookmark the permalink.